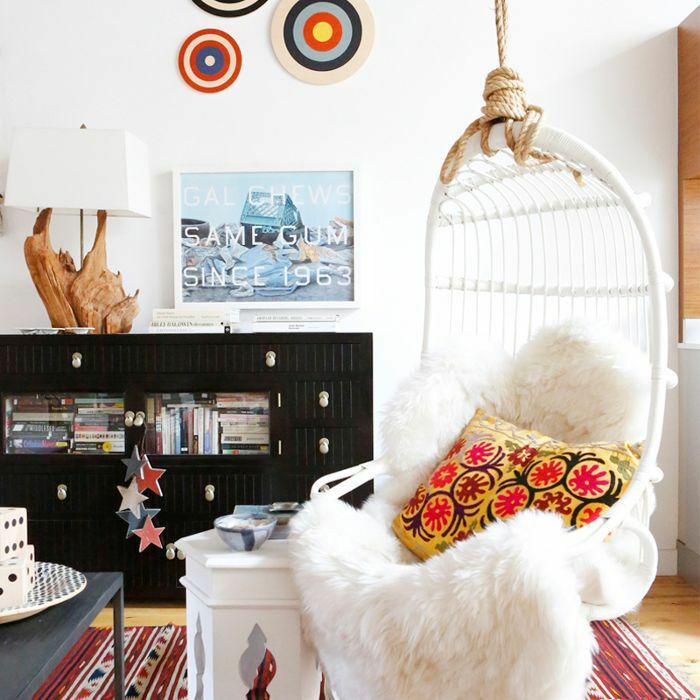 Although the hanging chair is often associated with bohemian-inspired décor and patio furniture, it's a piece that's far more versatile than you might think. Of course, a rattan hanging chair fitted with a colorful throw pillow and a plush cushion could easily fit right into a boho bedroom or living room, but the chair itself could also work in a Scandinavian-inspired space, a mid-century modern room, or even in a minimalistic home. It's all about which materials you choose, how you decorate the chair, and the style of the room you want to hang it in. It also truly can work indoors or outdoors, making it a fun and playful piece of furniture for just about any space. If you have the backyard space, consider hanging one on the patio where you and guests can relax in the summer or sun. It's a whimsical touch that will transform a boring seating area into a dynamic, spunky space. If you're not sure where to shop for such a chair, fret not. We've taken the liberty of sourcing a number of chic, stylish, and unique hanging chairs for you at a variety of price points so you can get the look you've been dreaming of no matter your budget. Keep scrolling to shop our picks. 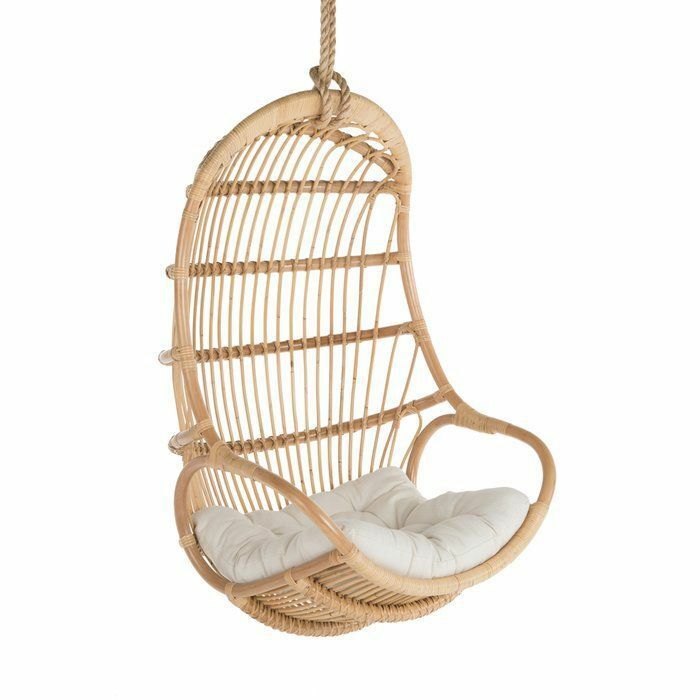 Although most hanging chairs are only built for one, this double rattan piece is large enough for two people to float together. It features white and natural rattan details for a fresh, beachy look. All you need are a few throw pillows and a blanket to create a cozy seat for two. 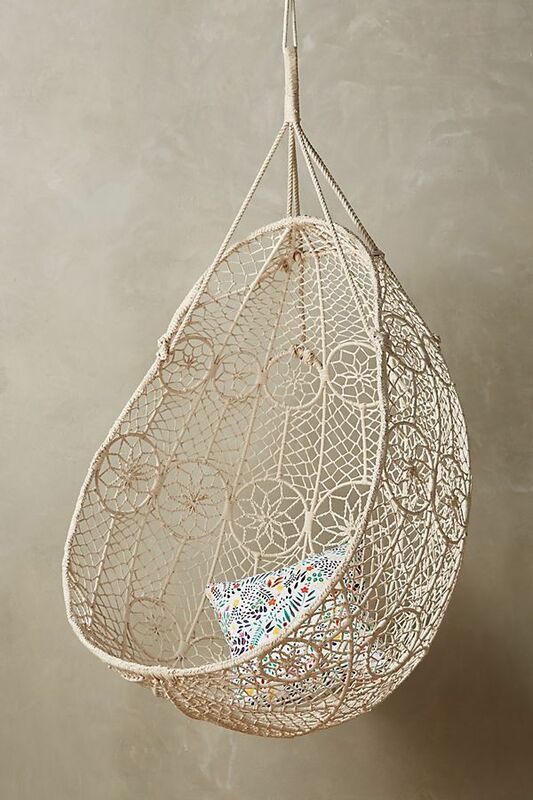 This egg-shaped hanging chair from Anthropologie is made of macrame for an airy, natural look. Allow it to hang easily from the porch for a comfy summertime seat or place it indoors in the living room for an unexpected décor element. Although it appears quite delicate, this piece can certainly support the weight of anyone who wants to take a load off. 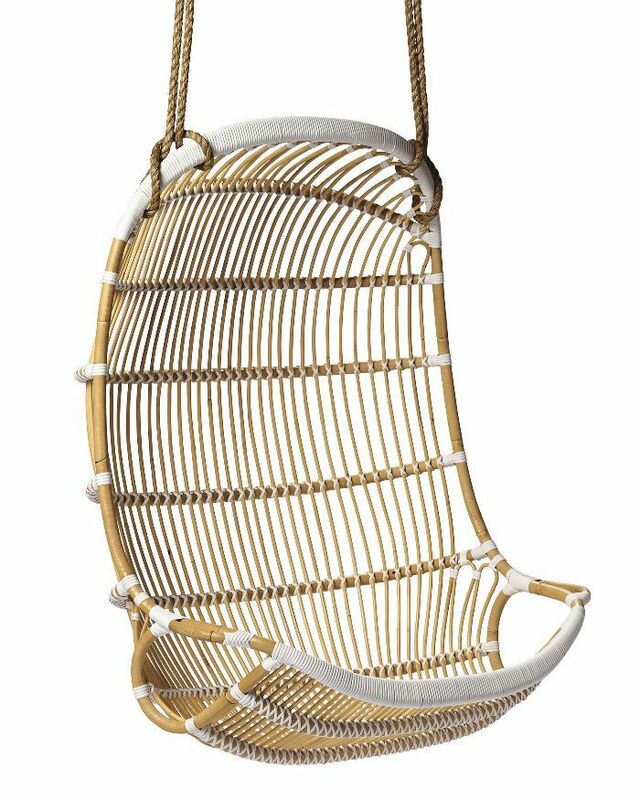 This rattan hanging chair uniquely features light and dark striped materials. It was inspired by a Scandinavian design from the 1960s and would look chic hanging in the corner of a living room or outside on a fully furnished patio. Its classic curved shape is perfect for curling up in with a good read. This pod-shaped hanging chair from CB2 is just begging you to curl up inside of it. Ideal for outdoor spaces, the eye-catching furnishing comes with its own cushion, however, you can also add your own throw pillows and blankets to make it truly one-of-a-kind. Sitting back and relaxing in this chair will instantly put you in vacation mode. 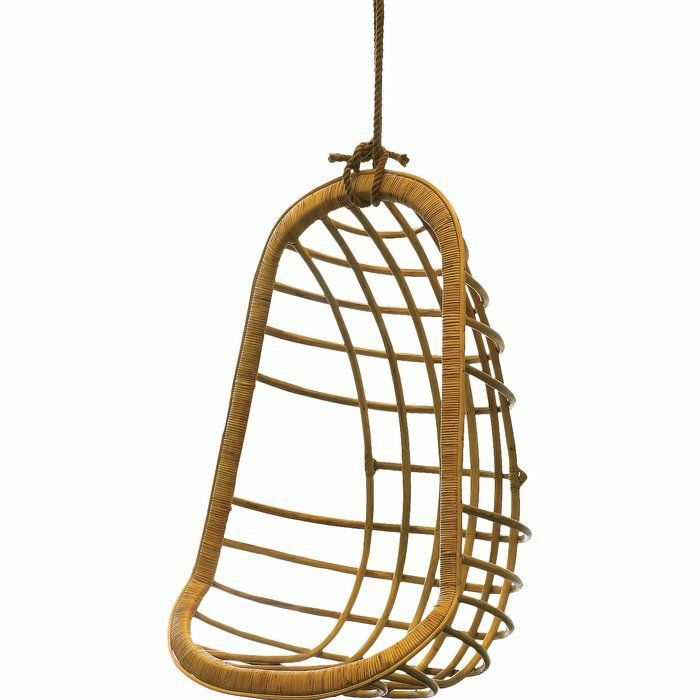 If rattan, teak, and macrame just aren't your style, consider a jute hanging chair like this simple piece. It offers the same statement-making look of other hanging chairs but it takes up much less space than other options. 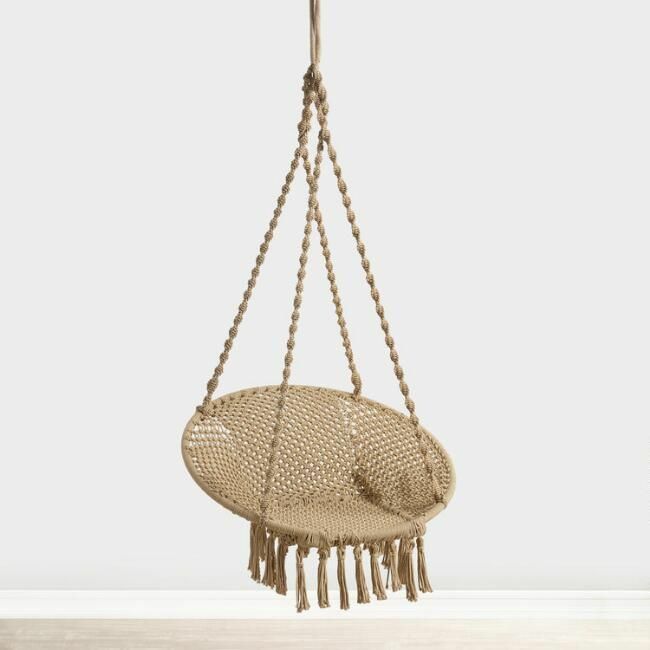 The piece is inspired by vintage hammock swings from India and would make an intriguing addition to any small space. 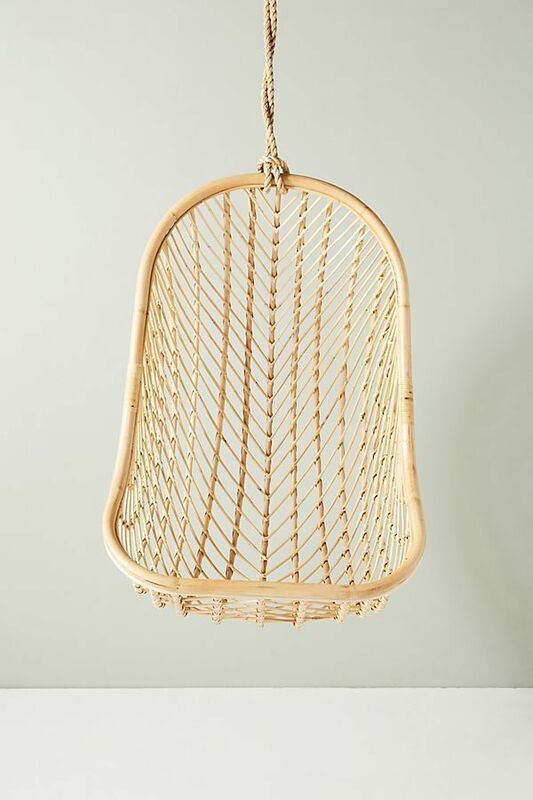 This rattan hanging chair from online retailer Wayfair comes fitted with its own custom cushion. While you can allow it to hang on its own and swing in the breeze outside, it also comes with a hammock stand if you're looking for a bit more stability or if you're unable to install the piece to the ceiling. 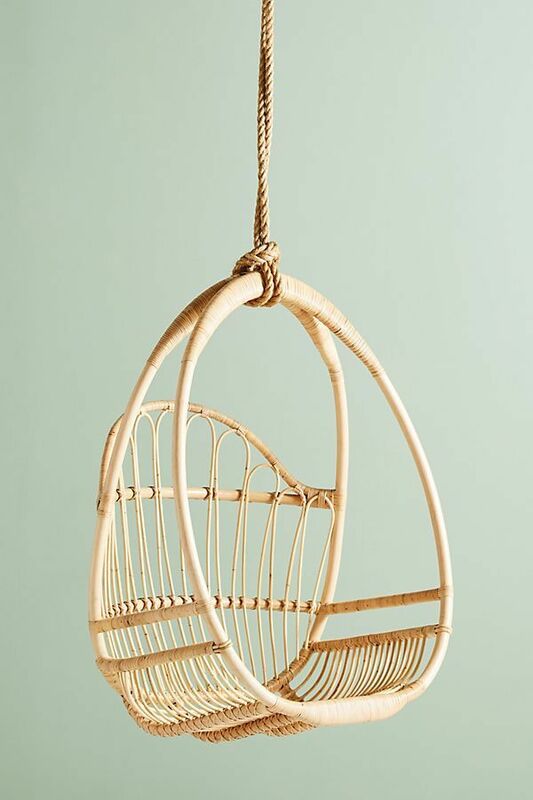 Made from teak materials, this nest hanging chair from Anthropologie would make quite the statement. Allow the natural, neutral design to speak for itself or infuse the piece with some more maximalist sensibilities by adding a textured throw blanket or a colorful pillow (or two). 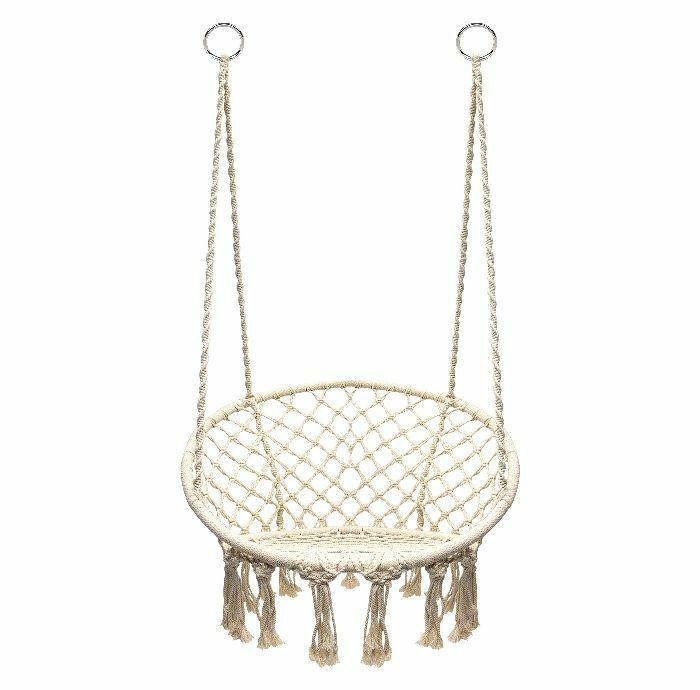 This rope chair from Target is made of cotton and looks effortlessly bohemian. It's off-white hue, woven design, and fringe details all work to create a whimsical seat fit for the patio or the bedroom. Hang it poolside to transform your backyard into a tropical retreat. 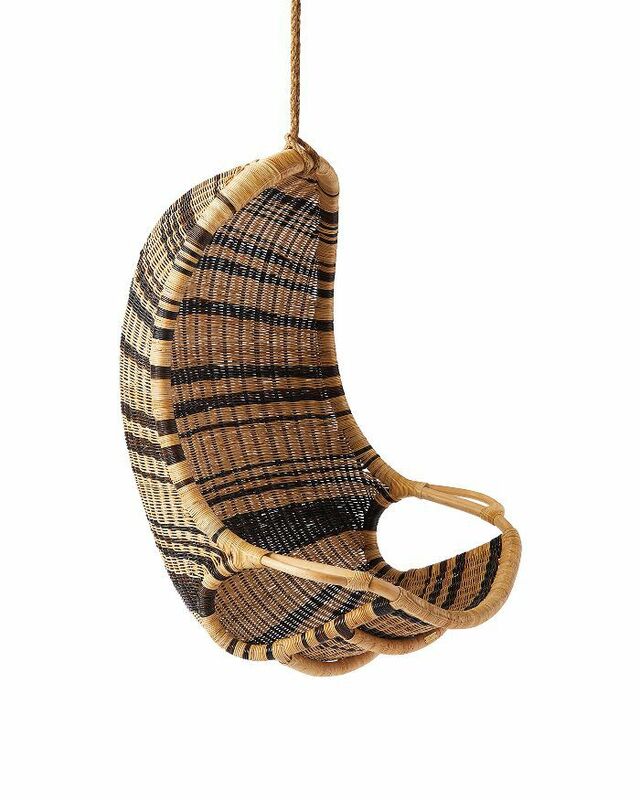 When you sit in this hanging chair, you'll be cradled by hand made bent rattan. The white shade of the chair gives it a contemporary flair while a heavy-duty rope is ready to safely suspend the piece of furniture. Whether your home is minimalistic or boho chic, this chair could work just about anywhere. This woven hanging chair comes from the creative, bohemian mind of interior designer Justina Blakeney and it's available at Anthropologie. It's oozing with the designer's signature style and would look lovely indoors or out. Its pod-shaped design differs from many of the more retro-inspired pieces you might find elsewhere, making it highly unique. 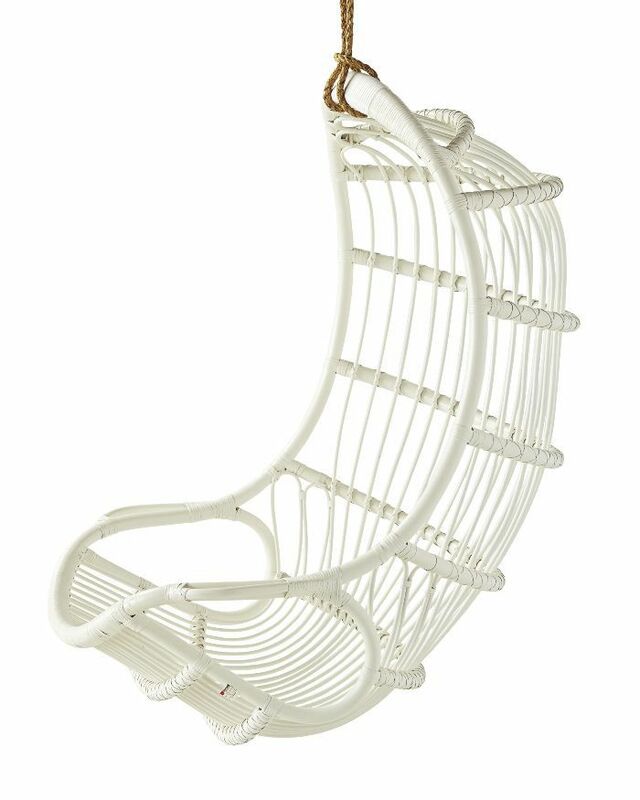 Transform any space into a Scandinavian abode from the 60s by hanging this chic chair. 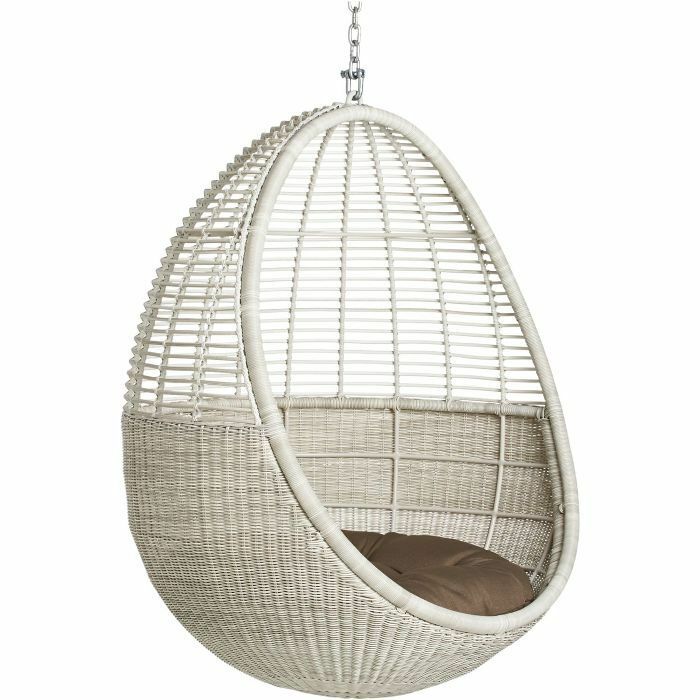 It's made of natural rattan and can work both inside and outside. The design features plenty of space in between the pattern of bent rattan for a light and airy appearance. Next up: Find your hygge: 17 cozy chairs that'll also win you style points.